The Agile Family: How Agile Can Improve Family Life! Do you have an Agile Family? Contrary to common opinion, Agile is not just for the business world. It can be an amazing way to further more bonding in families, and to introduce the idea of teamwork. Some years ago, on a Saturday, I watched my eldest son create a list of household clean-up items on post-it notes, and then all four children had to choose one item to start. When they chose an item, it went into the “in progress” line, and when they finished a task it went into the “done” pile. After a task was “done,” each child would choose a new task, until all the work was completed. At that time, I didn’t realize my son was using an agile strategy to encourage everyone in the household to participate in chores. I thought he was just very clever, and why hadn’t I thought of that when I had younger children? Soon after, when I began working for BERTEIG (my son’s company), and I had to learn a lot of new ideas from the business world, I realized he was using Kanban/Scrum methodologies at home. In writing about this, my purpose is to introduce readers to this insightful online article called Strategies of Agile Families. I believe it will prove to be very helpful. Enjoy! Even after attending 2-day trainings for both ScrumMaster and Product Owner certifications, the real significant difference between ‘project’ and ‘product’ didn’t emerge, for me, until becoming a Product Owner of a Weekly Care Package. That’s when the deep learning began. I hope by sharing some learning here, other new (or old) Product Owners might consider the shift in thinking around working with products rather than working on projects. 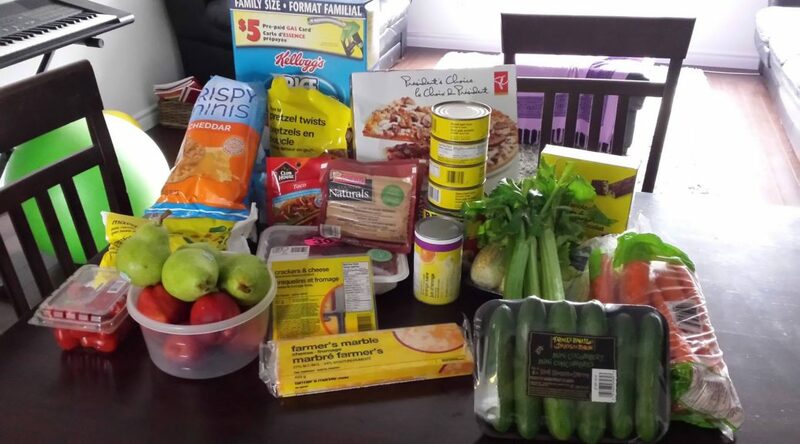 When first agreeing to formally launch and support a social action initiative to provide fresh food weekly to a neighbour who is experiencing financial hardship, I could easily see how food could be collected, packaged and delivered in weekly increments. As a Product Owner, I would oversee what items came into the package and ensure everything was delivered on time. Reaching out to a few friends, neighbours, and colleagues resulted in dozens of people contributing to the package consistently over a period of a month. Surprisingly, approximately $400 was also donated. Without a doubt, the first iterations proved there are interested contributors and also a grateful recipient. Interestingly, an experienced Agile trainer & coach, took notice of my efforts. He offered some advice, as a ScrumMaster might share with a new and fledgling Product Owner. In a half-hour conversation, he counselled me on some features of agile product development. He shared a few meaningful links with me, and after reminding me that Product Owners work with products, not projects, he invited me to return to an article I had written on the initiative. I followed his guidance and when returning to my piece I found the word “project” used about half a dozen times, speckled through the article. Clearly, even though I was consciously creating a product called ” a weekly food package,” still I was unconsciously thinking of the initiative as a project. When I modified the article to insert “product,” then the way I saw the work also changed. As a project, each time I deliver the package, the work is done. Project complete! As a product, which is a part of a delivery model called Scrum, it means each time a package is delivered it is then time to reflect in a retrospective. It’s time to learn and plan for next week’s delivery. My new understanding of product development, which emerged from watching this Myths of Scrum video and reading this is that action can begin even with minimal planning. Interested people volunteer as they wish to support the development. No one reports to anyone or assigns tasks to anyone. When a successful iteration is complete, it’s useful to come together to talk about how it went and apply learning to the next week’s product. Launching a New Product: #1 Question – Is this a Project or a Product? Recently, it’s come to my attention that a friend is experiencing nearly insurmountable financial hardship. After initially offering to help out by sharing a few food items, I realized that a few items shared once is not enough. This inspired me to consider the idea of sharing food weekly. I decided to create a regular care package of sorts, until she got back on her feet again. She agreed to pick up a care package from me weekly. And that’s how this social action initiative was born. Once I knew I’d be doing this weekly, several logistics had to be sorted out. Where was the food coming from? Where would I store the food between pick-ups? When would it be picked up? Interestingly, I don’t have enough food in my own cupboards to share with someone weekly. Fortunately, I know many others who are like-minded and highly value supporting and helping others so I began to reach out. Within days I had more than seven bags of food to share and it occurred to me that this would be my goal – 7 bags for 7 days. That should get her through the week. It didn’t take too long for me to see that if I considered myself as the Product Owner of this product – a weekly food package – that there might be valuable Agile concepts and practices which could easily help support the sustainability of this initiative. Immediately, an Agile Coach inspired me to think of this not as a project, but as a product. The main difference, he reminded me, is that a project has a start and an end. A product doesn’t have an end date. It can always improve. Before long, I realized that was an old way of thinking about work. When I thought about the food package as a product a lot changed. It became easier to see what was needed for this product to be useful to the recipient. The quality of this product became clear. Then I read this article by Mike Caspar which got me thinking about acceptance criteria and the importance of consultation, reflection, learning and planning. The key learning for me today is that when I think about this service of delivering a weekly care package as a product I see it’s likely it can continue indefinitely, always improving. That really excites me. It is not a project, but a product and is being organized and delivered using Agile methods. This is one way that Agile is being used outside of IT with great success. Challenge: As children age, they want to have more say in how they spend their time. Sometimes they don’t know how to express what is important to them or they can’t prioritize their time. Solution: Parents can easily include their children in decision-making by using an Agile playing card method. Here’s how it works. There is no limit to how much you can write. Place the sum of the two numbers on the corner of the post it. When all the post it activities have been gone through, then look at the top 5 or 6 items. These will likely be the ones you will have time for. Discuss if there are any over-laps and shift the list accordingly. Discuss what makes the most sense and what both would like to do. The chances are good that all of these items are ones that both/all people rated high, that’s what put them on the top of the list. It should be relatively easy to find a way to do the top 3-5 activities with little effort. PLAN for the day and ENJOY!! !